More than 70 experiments in one kit. Kids explore mind-stretching science principles while having fun. Introduce your child to the exciting world of science with the Big Bag of Science. Kids aged 8 years and older can perform more than 70 experiments with this kit, allowing them to explore mind-stretching science principles while having fun. 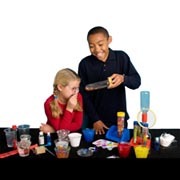 The kit comes with plenty of tools and safe chemicals to get your young scientist started, including test tubes, a magnifying glass, gravity goo powder, Insta-Snow powder, and many other supplies necessary to perform the experiments. With more than 70 activities covering life science, physical science and earth science, this kit encourages kids to discover new aspects of their world. 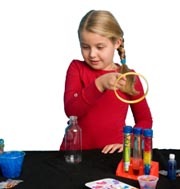 Topics in the lab book include chemistry, physics, geology, biology magnets, and many other arenas, giving your budding scientist a variety of ways to discover new facts. Your child will also get a look at the tools of science with the many materials included in this kit. The test tubes, pipettes, magnifying glass, Petri dishes, and other materials help to teach skills such as observation, classification, and measuring. Some of these experiments are messy and meant for the outdoors, such as the soda geyser experiment and the slime bubbles. Whether messy or not, each experiment is geared toward teaching kids about an exciting principle of science. Experiments toward the end of the lab book encourage kids to take their test tubes outside to see what they can discover and collect. With wit and humor, the lab booklet offers step-by-step instruction for each experiment and explains the science behind the process. The book helps your child and you, the adult assistant, explore cool scientific processes, like why the materials in baby diapers are absorbent, how compasses use magnets to work and what makes us burp. Kids will learn to determine whether a sunscreen works to block out harmful rays and discover the composition of water. All the powders and beads come in re-sealable baggies that help to reduce spills and messes. If kids don’t use the whole substance in the first experiment, they can seal it up and pack it away for later. Furthermore, the whole kit packs back into its zippered bag for an easy clean up.